blo Teens Read and Write: THE IRON WITCH by Karen Mahoney: Read the First Chapters! 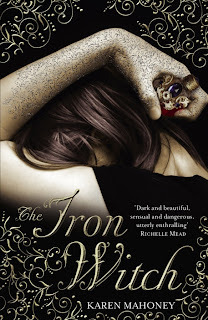 THE IRON WITCH by Karen Mahoney: Read the First Chapters! I just read the first couple of chapters of THE IRON WITCH. Looks good! Check it out HERE! The cover is lovely. I'll have to pick this one up next for TBR pile. Really? Yah! Cool tip. Thanks a zillion! Kaz is on my list as well, Iron Witch says soooo good! !